A new service using long lasting fibres mounted onto a wooden frame for high quality, large format canvas prints is being launched during “Focus-Exhibition-Week” and in time for “Mother’s Day” by FotoInsight. The company is known for its photo gift and photo book printing to be competitive through large volume, hi-tech production processes. Taking good photographs has never been easier. Many digital images lingering on computer hard drives could shine if being displayed on an office wall, the reception or in the sitting room at home. Until recently photo canvas printing was done by small workshops at horrendous prices. 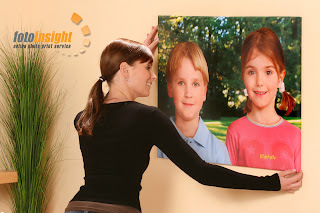 FotoInsight claims to apply the latest technology and efficient production methods to offer what it calls big canvas prints at low prices. FotoInsight, a specialist serving amateur and professional photographers alike, prints canvases in sizes from 20x30cm (minimum resolution 800x1.100 pixel) to 60x80 cm (2.500 x 3.300 pixel recommended). FotoInsight states that it uses man made optimised fabrics and fade resistant "archival" inks to guarantee longevity and brilliant colours. The hi-tech inks penetrate deep into the fabric and can therefore be printed and mounted over the edges of the wooden frame. Standardised sizes allow a largely automatic production process. According to FotoInsight this ensures constant quality and long durability at lower prices for the first time. Frame mounted giclee prints convert holiday snaps into large format artwork. The fine structure of the fabric creates additional depth, and the print extending over the frame generates a 3D effect on the wall. As the durable fabrics are fully mounted no additional frame is required, the image can be put straight onto a wall. It is a great present suitable for the home as well as the offices. Photo prints on canvas are also well suited for digital art created with image editing software and filters. FotoInsight Managing Director Klaas Brumann states: “Image editing software like Photoshop or ArtMasterPro from Fo2PiX helps to create impressive digital art for which the output of an inkjet printer can’t do justice. Digital editing software creates new, impressive applications for mounted canvases.” Compared to images behind glass frames, a photo screen print or canvas shows more detail and a fine structure. Due to the fabric folding around the frame it also shows greater depth. "Quality is our priority. All materials we use are subject to extensive testing and are guaranteed by their manufacturers to last 100 years. This guarantee extends to photo printing on real photographic paper as well as to the screen print", emphasises Dr. Rolf Hollander, CEO of FotoInsight's production partner and Europe's largest photo finisher. Ordering canvas prints is as easy as with traditional photographic prints, poster or photo books. A clearly structured overview of formats and costs with their respective recommended resolution come together with a user friendly interface at FotoInsight web shop. FotoInsight ships mounted canvas prints in the UK, Ireland and 20 European countries also with a separate delivery address. In view of the package sizes this appears to be ideal for sending presents directly to friends and family. FotoInsight’s Head of Communications states: “The mounted canvas print is an ideal mother’s day present. With so many grandmothers living apart from their grown up children and grandchildren, the FotoInsight Team is happy to help with international direct shipments of mother’s day photo presents.” The hi-tech production processes enable FotoInsight to provide the frame mounted prints from £24.99 (plus £2.99 for postageand packaging) – prices well below of what used to be expected from mounted canvas prints, make it an ideal gift for Mother’s Day.